Fall hours begin September 11th. Saturday hours at Steele Memorial Library and Horseheads Free Library start September 16th. The Chemung County Library District is joining libraries nationwide in celebrating September as National Library Card Sign-up Month. Chemung County residents who don't have a library card are invited to stop by their local branch to get one. After all, cards are free to citizens of Chemung County with proof of current address. As part of the activities for the month, special instant winner prizes will be given away each day. Patrons will also have the opportunity to enter drawings for a prize from their neighborhood library, and a grand prize of 4 tickets to the Broadway show, A Christmas Story, at the Clemens Center. Thank you to the Clemens Center for providing this wonderful opportunity and for their support of libraries in our community. Entries can be made in three ways: get a new card, replace a lost card, or confirm your current information with us. Entries will be accepted until Friday, September 29th. The winners will be drawn by October 6th. Stop by your local branch during the month of September and get a library card--then you can stop by every month for the rest of your life to use it! 3D Print of the Month: Batman Fidget Spinner Frame (608 Bearings not included). One free per patron, $0.25 for each additional print. On Friday, September 15th, there will be a unique event featuring vehicle replicas of Optimus Prime, Bumblebee, and Barricade from the Transformers films series, as well as the Mach 5 from Speed Racer. They will be visiting select locations for brief stops (20-30 mins per location), including Steele Memorial Library, as part of a promotional tour for Twin Tiers Comic-Con at the First Arena. This will be a fun chance to catch a sneak peek at these amazing vehicles, before visiting T2C2 and hopping behind the wheel for a photo op! The tour will start at Steele Memorial Library at 11am. 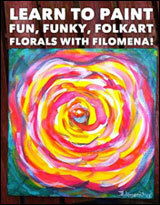 On Friday, September 29th, 2pm, come learn to paint bright and happy folk art inspired flowers with local artist Filomena Jack. All supplies will be provided, including artist quality canvas panels and acylic paints. These panels will allow us to paint on all the edges of the canvas with the image wrapping around the sides. Registration is required: 733-9175. Intended for adults and teens. Paid for by the Friends of CCLD. Teens: Got ideas for a program? Stop by TAG meetings, send ideas via our facebook, snapchat & teen tumblr accounts, or email Doris Jean, teen librarian (metzgerd@stls.org). Brainstorm future teen programs for the library, create displays, tell us what books, music to buy & more! Get volunteer hours credit. Make Steele Library YOURS! 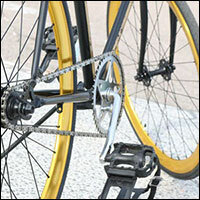 September 12, 6:30pm - Basic Bike Maintenance (for teens) BRING YOUR BIKE to the workshop. Call 733-9175. to register (get a multi-purpose tool and bike light). September 11 & 25, 5:30pm - Teen Writers' Group (note the new time!). September 5, 11am - Celebrate National Cheese Pizza Day with pizza stories and a pizza snack! September 26, 4pm - Celebrate Johnny Appleseed Day, come meet Johnny and hear his story, and do an apple craft! Toddler Storytime resumes this month at Big Flats Library! Storytimes will take place on Wednesdays at 10:30am, starting September 13. Stay tuned for more programs in October. Join us at Farm City day (growing together) at Eldridge Park on September 2 from 11am-3pm. We will have some book bundle giveaways, and a craft. 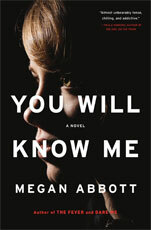 For the month of August we read "You will know me" by Megan Abbott. We will have our discussion on September 15th. We will be reading Story of Edgar Sawtelle by David Wroblewski this month to discuss in October. In September at Horseheads, We are holding a hands-on seed saving seminar. 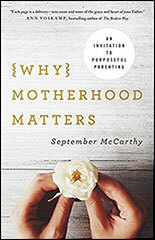 We are pleased to welcome September McCarthy for a book signing of her new book Why Motherhood Matters. She will have some copies on hand to sell. We also welcome back Wine & Design! Note that our Wine and Design is a NON-alcohol event. This program requires a $15.00 deposit to hold your spot (you will get the $15 back, if you show up for the class). Also, sign up to learn all about your tablet or smartphone! Join us on Monday September 25th for an American Girl Craft. We will make two doll size games and enjoy light refreshments. Bring your favorite doll to join the fun! Registration required. Kitty lit returns! 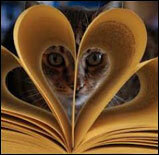 Come and read to the cats, open to grades 1 - 6. We are also starting a new home-school program. Call 739-4581 for details. September 21, 10:30am - Story time begins! 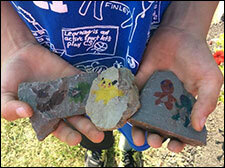 The Van Etten Library is supporting the Chemung County ROCKS Facebook Group by offering a rock painting program. Join us at the library Wednesdays in September, pick out a rock, paint it, and then go place it in the community for someone to find. This activity is free and fun for all ages. It will be an exciting and wonderful find for another community member. If you haven’t heard about this fun community building group, please visit Chemung County ROCKS Facebook to learn more. September 11th, 1:30-3:30pm - Tablet Talk; learn to use your device. Coming soon in October - Lego challenge club! 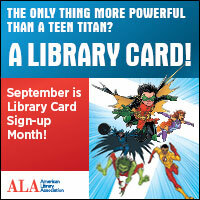 This month is National Library Card Signup Month! Stop in and enter for your chance to win our Library Lovers Basket. Homeschool and Storytimes start back up the week after school starts. Stop in and check out our NEW music collection and puzzle exchange!